#RemodelLife is a real thing. Any remodel is stressful, but a kitchen or bath room renovation typically are a lot more involved than any other type of remodel. There are so many details to worry about and so much more mess involved in a kitchen or bathroom! And, let’s not even talk about the inconvenience! But, when all is said and done and the last nail has been hammered and the small touches are in place, and you can finally step back and admire your beautiful new space knowing that everything turned out perfect in the end. With any renovation, it is a long process. In the beginning, there are so many decisions to be made, and it can easily become over whelming. With the help of your personal designer, the start of the process can be much smoother. You find out the beginning is the most fun part! You haven’t done anything yet and your space is still a blank slate of ideas and possibilities. Your designer shows you all the potential designs and you get excited and finally decide on a design for your new space! Colors have been chosen, the cabinetry and small details have been ordered and the room is finally coming together with color swatches and Pinterest photos. At this stage of the remodel, everything has been ordered, the cabinets, the knobs, the lighting and all the fancy upgrades are on their way. Demolition is well under way and you’re there through all the dust, cement floors, and living off a foldable table for a kitchen or bathroom vanity. And then, finally, pieces have arrived and you’re one step closer to the finished product! But wait, not so fast, one of the cabinets is chipped on the corner! You immediately panic and call your designer. At this point, remember that mistakes happen during a renovation and it’s not necessarily anybody’s fault. Just stay calm and patient and know that your designer will do everything to make you happy. Everything is done—except for the smudges on the cabinets, there’s one wrong knob on the cutlery drawer, and the countertops are dirty. The installers arrive for the last time to finish up and then your space is done! Your designer who has been through the whole process with you knocks on your door with the finishing touches to your space, the personalized hand towels or the special kitchen décor are all ready for their permanent home in your brand-new space. 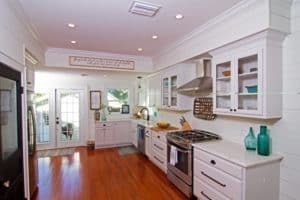 The whole process automatically becomes worth all the headaches and the issues along the way, because right before your eyes is a new space in your home to create memories in for years to come.